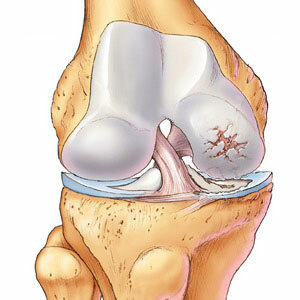 Chronic degenerative disease in which the cartilage between the joints wears away; also known as degenerative joint disease and hypertrophic arthritis. Persons most commonly affected: Adults of both sexes aged over 45 but more common in women. All persons are affected by changes in the joints with advancing years but not all have serious or disabling symptoms. Organ or part of body involved: Usually weight-bearing joints, especially toes, fingers, ankles, knees and spine. The finger joints are also susceptible, possibly because they are used so much. Often it is the fingers that first show visible signs of the disorder. Symptoms and indications: Stiffness and pain in affected joints. The aching may be weather-affected and worse when it is cold and damp. There is loss of dexterity and movement in the affected joint. There may be a cracking or grating sound with movement and the joint may show signs of swelling. It is often accompanied by muscle wasting and weakness in the affected area. Causes and risk factors: Most cases of osteoarthritis have no known cause, and are called primary osteoarthritis. When the cause of the osteoarthritis is known, the condition is called secondary osteoarthritis. Primary osteoarthritis is mostly related to aging. With aging, the water content of the cartilage increases and the protein makeup of cartilage degenerates. Repetitive use of the joints over the years irritates and inflames the cartilage, causing joint pain and swelling. Eventually, cartilage begins to degenerate by flaking or forming tiny crevasses. In advanced cases, there is a total loss of the cartilage cushion between the bones of the joints. Loss of cartilage cushion causes friction between the bones, leading to pain and limitation of joint mobility. Secondary osteoarthritis is caused by another disease or condition. Conditions that can lead to secondary osteoarthritis include obesity, repeated trauma or surgery to the joint structures, abnormal joints at birth (congenital abnormalities), gout, diabetes, and other hormone disorders. Some occupations are likely to pose a greater risk, e.g. certain sports, ballet and dance or other activities that put joints under stress. Prevention: Exercise the joints and muscle to improve strength and flexibility. Manage weight to relieve stress on weight-bearing joints.